Every year, the Prospanica Leadership Summit convenes Latinos who drive change in their professions and communities. Over the course of three days, Prospanica’s chapter leadership and members dive into topics and hands-on experiences designed for immediate application across their spheres of influence. The summit features keynote speakers, breakout sessions, and special events that offer resources, tools, and opportunities for peer engagement and learning. The 2018 Prospanica Leadership Summit entitled Effecting Change: From Personal Influence to Collective Impact was held from February 8-10, 2018 in Dallas, Texas where Prospanica is headquartered. With sessions for both Prospanica chapter leadership and other business professionals, the Summit highlights how to transform personal effectiveness into community-wide change. Among the distinguished presenters were Dr. Dale Fodness of the University of Dallas, Satish and Yasmin Gupta College of Business who provided a workshop on Social Innovation and Entrepreneurship as well as an additional session on Becoming a Changemaker. Also from the University of Dallas, Satish and Yasmin Gupta College of Business, Dr. Brett Bourbon conducted an insightful presentation on Strategic Thinking and Storytelling, while presenter Keith Owen from the UNT College of Visual Arts + Design delivered a hands-on workshop entitled Design Thinking: New Perspectives. Dr. Vincent Ramos, Principal at Psychological and Forensic Mental Health Services shared powerful advice on Achieving Work-Life Balance: Unique Challenges to Latino Success. The Prospanica Leadership Summit convenes Latinos who drive change in their professions and communities providing a space where they can dive into topics and hands-on experiences designed for immediate application across their spheres of influence. The summit features keynote speakers, breakout sessions, and special events that offer resources, tools, and opportunities for peer engagement and learning. The Prospanica National team prepared a robust schedule for attendees of the 2018 Leadership Summit. Brandie Steadham, Prospanica National’s Event & Membership Specialist (Left) and Monica González-Williams, Chapter Relations Manager (Right) shared all the details of the 3-day event with chapter leaders and Prospanica members upon arrival. The 2018 Prospanica Leadership Summit: Effecting Change - From Personal Influence to Collective Impact provided an opportunity for new members assuming leadership roles at the chapter level, and seasoned Prospanica leaders to come together to acquire the necessary knowledge to effect change. The 2018 Prospanica Leadership Summit also included prominent speakers who demonstrated the importance of collaboration among Latino-led organizations. 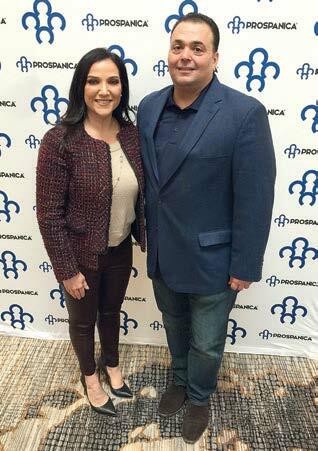 Thomas Savino, Prospanica CEO, welcomed Raquel Tamez, CEO of the Society of Hispanic Professional Engineers (SHPE), who provided Summit attendees her insight and encouragement as well as powerful advice regarding careers in STEM.